When career lifesavers get the chance to save even more lives, they step up to do their part. The City of Miami Department of Fire-Rescue has turned out in large numbers to join the Gift of Life Marrow Registry during drives held at a number of stations during May, 2018, with additional drives to be scheduled in future months. 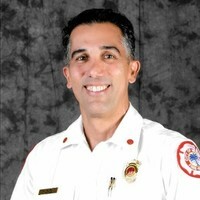 After seeing a flyer about Gift of Life posted at Miami-Dade Community College, Captain Manuel Arango, Fire Department Safety Officer for the City of Miami Department of Fire-Rescue, reached out to the organization. After speaking with Gift of Life’s Community Engagement Coordinator Joe Baldelomar, drives were set up for two weeks in May to invite the firefighters to join the registry. With approximately 800 employees working in shifts at 15 stations, the drives were arranged to swab the firefighters during working hours. Some firefighters also have EMT or paramedic training. Founded as a fire department in 1898, rescue services were added in 1939, and it became the first department in the country to use two-way radios on all its trucks and among the first to implement CPR as a lifesaving technique. Today, the department covers 54 square miles of territory. Since there are three shifts at each station daily, Joe spent an entire day at a station to catch the EMTs during their shift changes. The announcement that “The Marrow Man is here!” went out over the loudspeaker several times each day for two weeks. To date, 200 of the firefighters have joined the registry as volunteer donors. After holding drives at every station, Captain Arango hopes to bring Gift of Life to other Miami-Dade agencies and to the many municipalities served by the department. Gift of Life is honored to partner with the dedicated lifesavers of City of Miami Fire-Rescue. Thank you for your commitment to our mission to cure blood cancer.